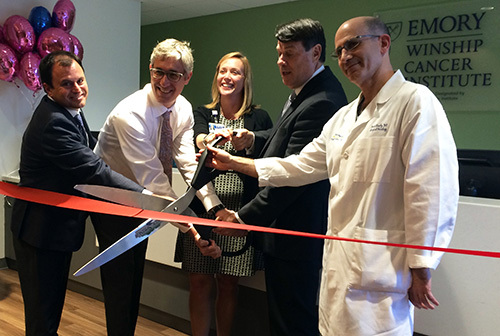 Peter Rossi, MD, director of radiation oncology, Stephen Szabo, MD, director of community oncology, Heather Dexter, CEO of Emory Saint Joseph's Hospital, Rusty Paul, mayor of Sandy Springs, and David Kooby, MD, director of surgical oncology. The community oncology program, led by director Stephen Szabo, MD, treats patients with many types of cancer. This comprehensive care also includes valuable patient resources such as a dietician, genetic counselor, and social workers on staff.